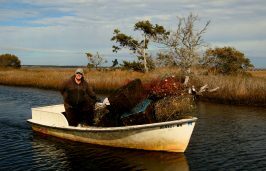 OCEAN – Nearly 600,000 pounds of debris causing navigational hazards and littering salt marshes, seagrass beds and oyster beds was removed from Carteret County waters as part of a two-year project by the North Carolina Coastal Federation, National Oceanic and Atmospheric Administration, North Carolina Sea Grant and commercial shellfish operations, the federation announced Monday. 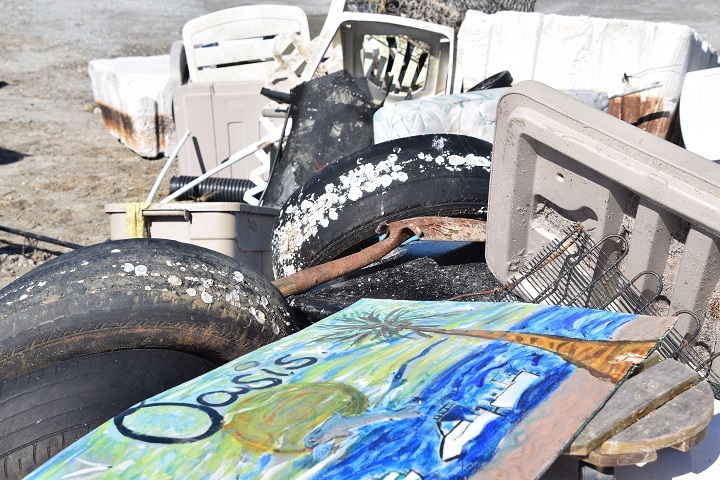 In addition to debris removal, the partners created a North Carolina Shellfish Mariculture Best Management Practices for the Prevention of Marine Debris for new mariculture growers to eliminate future mariculture industry-related marine debris. “These BMPs are a product of a unique partnership with commercial growers who acknowledge the marine debris risk from the industry and want to keep the environment they rely on clean and healthy,” said Bree Charron, federation coastal specialist in the central region, in a statement. Throughout 2017 and 2018, volunteers with the federation, NOAA partners and area contractor, Brooks Dredging and Marine Construction Inc., removed the decades-old mariculture operation debris that included pilings, plastic cages, buoys, netting, ropes, piping, sandbags, screens and other offshore and embedded aquaculture debris from an abandoned mariculture site near Harkers Island. 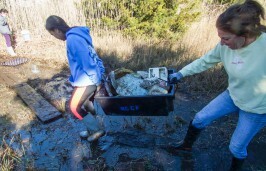 The Duke University Marine Robotics and Remote Sensing research group used drones to help search for debris not be visible from land for removal and determined how the marsh recovered after the cleanup. The BMPs guide created as part of the project includes ways to prevent and reduce debris from mariculture operations, which depends on using man-made gear in the marine environment. The BMPs cover siting, design and maintenance strategies for mariculture operations as well as gives new growers and lease applicants instructions on how to keep gear on the farm during normal operations as well as in preparation for a storm. For more information, contact Charron at breet@nccoast.org or 252-393-8185.